Challenging Genders is an introduction to non-binary individuals who were, in this case, assigned as female at birth but do not identify as strictly binary male or female. 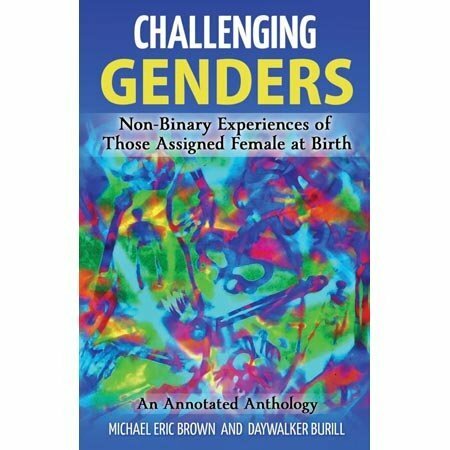 Challenging Genders is an introduction to non-binary individuals who were, in this case, assigned as female at birth but do not identify as strictly binary male or female. The book delves into a number of gender identities and what it means to be first perceived as a girl, then a woman and not identifying as either but instead identify as non-binary. These are people who you meet and speak with every day. When you go to work, when you play your weekend sports, when you’re grocery shopping – they are there. They are your doctors, your teachers, your hairdressers, your attorneys, your neighbors, your friends, and yes, even your children, siblings, and parents. Readers will learn about terminologies (including the ones defined by personal experience), common attitudes and perceptions in society, and issues such as pronoun usage, misgendering, gender expectations, and discrimination. Part I is concentrated on education, while Part II consists of the contributed stories of sixteen non-binary individuals who have chosen to share their stories with the world.